European Central Bank officials lack enthusiasm for any revamp of their negative-interest rate tool and some doubt it will actually happen when an analysis of the policy is completed, according to people with knowledge of the matter. 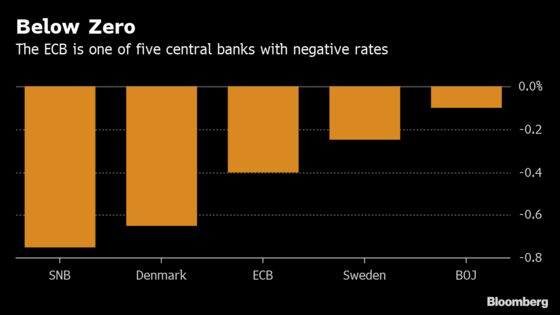 ECB policy makers aren’t opposed to President Mario Draghi’s move to examine the impact of the measure but many don’t yet see merit in a switch to so-called tiering to exempt some bank excess reserves from the deposit rate, said the people. They didn’t want to be identified because such discussions are confidential. The euro pared its decline on the news. It was little changed at $1.1298 as of 12:36 p.m. Frankfurt time, having earlier been as low as $1.1280. Among various motivations for keeping the status quo are a reluctance to damp the effect of the existing tool, worries about the possibility of signaling future rate cuts, and concerns that the ECB is becoming held responsible for the profitability of lenders, the people said. The combination of inertia and hardening opposition to change in the ECB’s sub-zero monetary policy is emerging in the aftermath of an inconclusive meeting last week. Policy makers committed only to analyze the matter as a follow-through from Draghi’s surprise call to “reflect” on a potential revamp. The ECB’s deposit rate, currently at minus 0.4 percent, has been below zero for nearly half a decade. The ECB has been looking for ways to combat an economic slowdown that threatens to frustrate its attempts to deliver sustainable inflation for the euro region. In March, it downgraded its growth outlook and unveiled a new bank-lending program just three months after halting asset purchases. Draghi’s call for a review of the negative-rate policy underlines how the ECB still has plenty of ammunition to support the economy, the people said. However while the tiering debate has stoked some speculation among analysts that such a move could pave the way to lowering interest rates further if needed, policy makers haven’t discussed cutting, the people said. The ECB could signal after the analysis that tiering is an option for the future, making the possibility of further rate cuts easier if they were needed, two of the people said. An ECB spokesman declined to comment on the Governing Council’s discussions. The president has succeeded in the past in pushing through policies that his Governing Council needed persuading on. Both the development of the ECB’s crisis-fighting tool -- Outright Monetary Transactions -- and the deployment of quantitative easing were signaled by Draghi before officials backed them.